Working with the short loin, the Peter Lu ger Steakhouse crew selects only USDA prime, aging it precisely, cooking it to the requested temperature, and serving it in an old-timey dining room. Peter Luger Steakhouse is not quite the oldest restaurant in New York City, but it is very likely the most beloved, with a great tradition and the best steaks. The name Peter Luger Steakhouse is known throughout the North American steak-eating community. It’s a legend. Part of this legend is the meat, only USDA Prime, which often represents less than 2% of graded beef cattle, selected for color, age, marbling, and texture. Then there’s the on-site dry aging, which keeps the meat at carefully regulated degrees of temperature, humidity and air circulation. After aging, the meat is butchered and trimmed. 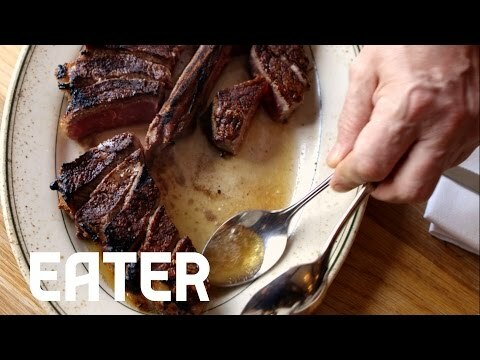 Finally, the legend of Peter Luger depends upon how well the meat is prepared by a kitchen full of guys who seem like they each have over a century of experience at the grill. They know what they’re doing, and you’ll like the way that experience tastes. In addition to the much-lauded porterhouse, the short loin – the primal cut that the Peter Luger team focuses on – also yields strip steak and T-bone, which are never pre-cooked. After they’re cooked thisclose to the requested temperature, they’re removed from the broiler, cut on a platter that contains just a little butter, then put back under the broiler until the internal temperature of the meat is at exactly the right amount of doneness. Peter Luger Steakhouse is one of the great American steakhouses; if you like steak, you should pay a visit to this standard-setting, classic restaurant. Peter Luger Steakhouse has for many become the steakhouse by which other steakhouses are judged. stay up-to-date & receive our latest updates! Email and zip code are required.